The daily deal scene is big and is getting bigger, with players constantly finding ways to differentiate themselves from the rest of the pack. Washington, DC-based Deal For Deeds (www.dealsfordeeds.com) takes the high road by combining social group buying with a social mission. Deal For Deeds‘ current membership of 15,000 individuals get exclusive offerings from local DC businesses, vote on featured non-profit causes and collective decides on which charities the site partners with each week. 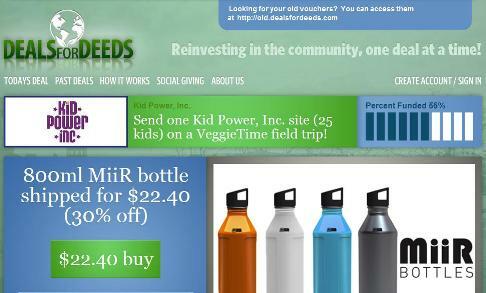 The site also donates a minimum of five percent of gross sales to various charities. Since it was founded in April this year, Deal For Deeds has worked with more than 100 businesses to raise S$8,000 for 18 nonprofit organizations in Washington, D.C.
We like that the site’s new blog features community businesses, large and small and individuals who are socially and environmentally responsible. We can only hope that more daily deal sites around the world, especially those in Asia, picks up a socially-conscious mission like Deal For Deeds does as well.